My triangle towel topper uses a finger towel and a recycled plastic milk jug ring for a hanger. I really like the idea of the round ring as you can hang up the towel on a cabinet knob or hang it up over a hook. It works up very quickly and I made the first one using less than an ounce of thrift store sport cotton. This one had 48 stitches along the top as the yarn was thinner. Here is a closeup of the finished top. You can click on the photo to supersize it. When I made the red triangle towel topper, I used regular cotton weight yarn. It’s Bernat Christmas Sparkle. 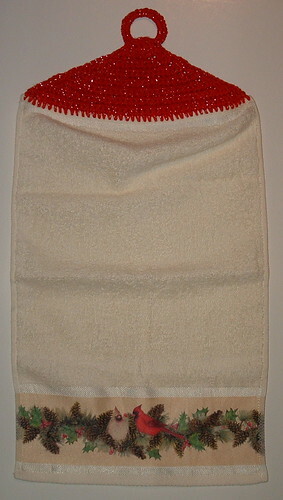 Because the red triangle towel topper is a thicker weight yarn, it has 44 stitches across the top edge of the towel to start. But don’t worry about the number of stitches across the top, just do your single crochet stitches evenly along the top edge. You can always adjust your stitches as needed as you work your topper. I did one extra row for the flap on the red topper. With 4 rows, the turning flap was a bit longer but you can do just 3 rows if that works for you like I did with the sport weight yarn on the blue triangle towel topper. I used Christmas finger towels for this project but you can use towels of different widths or lengths. Just adjust your stitches as needed to end with a 4-stitch wide flap for the fold over the plastic ring. I used plastic milk jug rings but you can also use recycled juice or other round rings for this project. Make sure you crochet lots of stitches around the plastic ring to cover it entirely with the yarn. 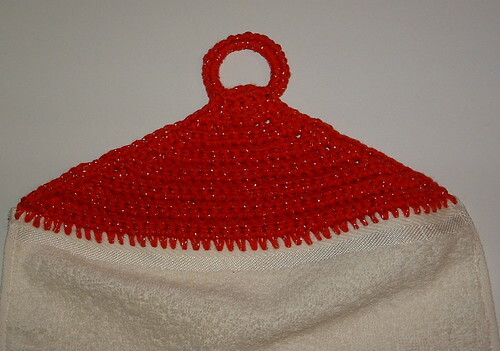 I found this gives the project a nice look and no one with ever know that you used an old plastic jug ring for your crochet project. As always please enjoy the free pattern below and happy crocheting to all! Because finger towels are shorter, there is no cutting or sewing necessary to begin your base row. You will use the steel hook to poke the first hole into the right side corner and pull the yarn through the hole. Then use the G hook to complete your first Sc st. Then move onto the next hole until you have worked completely across the base row evenly with your stitching. 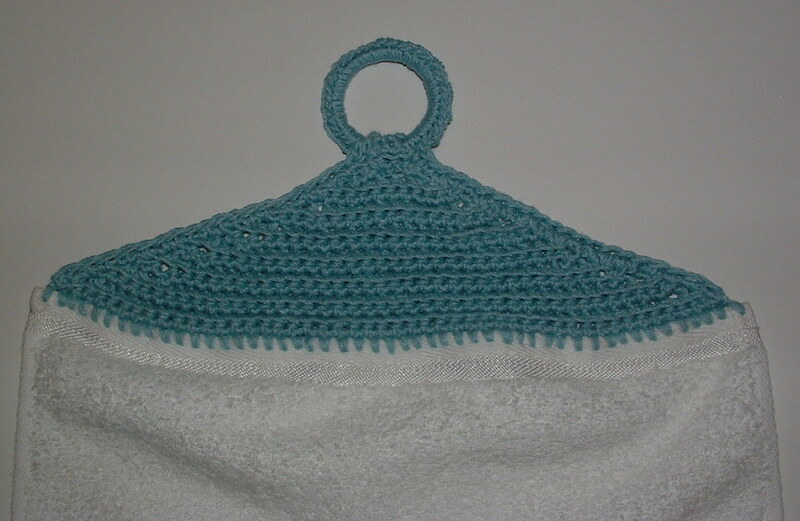 Once you have the base row done, you will only be crocheting with the G hook. Using the steel crochet hook as explained above to poke holes, Sc evenly along the top edge of towel. Using the G crochet hook, Ch 1, turn. Sc in each st.
Ch 1, turn. Sk 1st st and working in BLO, work 1 Dec (2 Sc tog) over the next 2 sts twice. Then Sc in ea st across to the last 4 sts. Work 1 Dec (2 Sc tog) over the next 2 sts twice. Continue working in just BLO, Ch 1, turn. Sk 1st st, Sc in ea st across. Repeat Rows 3 and 4 until you have just 4 sts left. Work even on 4 sts with Sc in ea st, Ch 1, turn. This is for flap for ring. Repeat twice more. Fold flap over on backside of towel over ring. Cut yarn and leave a long tail to use to sl st across flap to secure ring in place. FO. 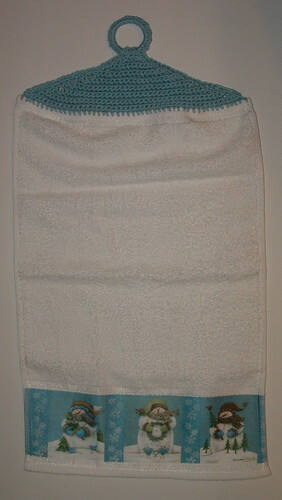 With RS of towel facing, join yarn at lower right hand corner of towel. Sc along edge of towel topper up to ring, then Sc around the ring to cover the plastic ring. Then Sc down the other side of towel topper ending at the corner. FO. Genius idea, thanks for sharing. My towels are always falling off their hooks. Have you ever thought about cutting the hook at the bottom so it could hang on handles instead of knobs. We don’t have knobs, but it you make it opening at the bottom near the crochet, it might work like the hooks on thing in the retail market. Make sense? Tami — I don’t have handles on my cabinets but have a few hooks in the kitchen. This is why this works for me. I also have a magnetic hook on my refrigerator so I can hang this towel there too. Thanks for the idea though. Lovely and utilitarian at the same time. Love when that happens. I apologize for the long silence. My mom died just before Christmas and I’m way behind in everything. These towels are creative, useful and attractive. I’m putting this on my ideas list. Thanks so much for sharing your patterns with us. May your 2012 be a wonder-filled year.